In the present study, the temperature data of 125 stations (1941 to 2012) over parts of India have been analysed to evaluate trends and homogeneity using various statistical tests. The annual average, maximum, and minimum temperature data showed a positive trend of 0.44 °C/100 years, 0.51 °C/100 years, and 0.19 °C/100 years, respectively. 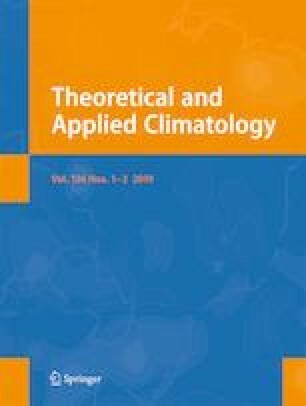 All the seasonal temperature variables exhibited a positive trend with exception of the minimum temperature of the monsoon season which showed the negative trend at the rate of 0.05 °C/100 years. The maximum temperature of monsoon season depicted a maximum increase at the rate of 0.80 °C/100 years. The results indicated that the process of urbanisation impacted over the change in temperatures. The homogeneity analysis showed the break years at 1972, 1974, and 1977 for annual average, maximum, and minimum temperatures, respectively, for entire India. The seasonal analysis exhibited that the minimum temperatures of both winter and monsoon seasons and the maximum temperature of the post-monsoon season were homogeneous in nature. The rate of change in magnitude for all annual and seasonal temperature variables showed a considerable increase after the break years. The authors are thankful to Dr. Asmita Murumkar, Dr. Annat Rai, Dr. Brajesh Kumar, Mr. Titas Ganguly, Ms. Bratati Chowdhury, and Ms. Divya Ravi Prakash for providing useful suggestions. The authors want to sincerely thank the India Meteorological Department for providing the temperature data set. The authors received financial support from MoWR, R&D, and GR, Bharat Singh Chair for Water Resources at IIT Roorkee.